America has developed a “culture of contempt”—a habit of seeing people who disagree with us not as merely incorrect or misguided, but as worthless. Maybe you dislike it—more than nine out of ten Americans say they are tired of how divided we have become as a country. But hey, either you play along, or you’ll be left behind, right? 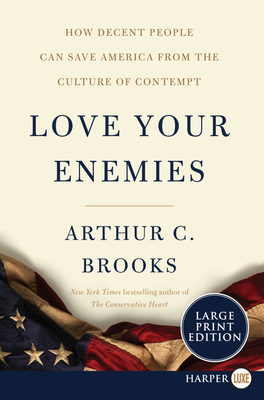 In Love Your Enemies, New York Times bestselling author and social scientist Arthur C. Brooks shows that treating others with contempt and out-outraging the other side is not a formula for lasting success. Blending cutting-edge behavioral research, ancient wisdom, and a decade of experience leading one of America’s top policy think tanks, Love Your Enemies offers a new way to lead based not on attacking others, but on bridging national divides and mending personal relationships. Love Your Enemies is not just a guide to being a better person. It offers a clear strategy for victory for a new generation of leaders. It is a rallying cry for people hoping for a new era of American progress. And most of all, it is a roadmap to arrive at the happiness that comes when we choose to love one another, despite our differences. Arthur C. Brooks is president of the American Enterprise Institute, where he also holds the Beth and Ravenel Curry Chair in Free Enterprise. He is the author of eleven books, including the bestsellers The Conservative Heart and The Road to Freedom. He is an op-ed columnist for The Washington Post, and host of the podcast The Arthur Brooks Show. Previously, he spent twelve years as a professional classical musician in the United States and Spain, including several seasons as a member of the City Orchestra of Barcelona. A native of Seattle, Brooks lives with his family in Bethesda, Maryland. In the fall of 2019, he will join the faculty of the Harvard Kennedy School and Harvard Business School.